Over the past six weeks I was taking a night class at San Diego State University focusing on craft beer. It is a beverage type that has been steadily increasing since 1996. Listening to me talk about beer has shocked many of my colleagues because they have always known me as the wine guy. Little do they know is that after a long hard day at work, I usually crack open a bottle of beer and not wine. I do this for two reasons, first of all the beer is cold and refreshing. Secondly, opening a full bottle of wine would force me to drink a full bottle. Once opened, I can’t let it go to waste. Now, the title of this post says, Grain versus Grape. So in order for the title to make sense and hit all the SEO points I need to hit, I am going to put wine and beer styles head to head. Before I begin, let’s take a look at beer and its enormous growth in popularity. Since prohibition, when beer and all other alcoholic beverage industries flat lined, beer has been on an increase. Immediately following prohibition there were macro breweries focusing on making a beer that was easy to drink. They pleased the new adults of legal drinking age who were not accustomed to drinking. Instead of brewing those dark beers brewed in England, Germany and Belgium, they chose to brew light-colored beers made with inexpensive adjuncts such as corn and sugar. These beers were accessible to the new American drinkers. Soon with the help of advertising, these macro breweries dominated the beer market. Not until Jimmy Carter allowed home brewing in 1976 did we see real beer come into the marketplace. With innovative breweries such as Anchor Steam, Sierra Nevada and the New Albion, beer became craft. Today the market place has seen a drop of 1% in beer sales, but an increase of 5% of craft brewing. This can only mean that people are not drinking fizzy yellow beer and looking for proper brews. My company sent me off to take this beer course so that I can stay with the times. They believe that beer is soon going to take over wine sales. I don’t believe that is true. I think both can live harmoniously together in the same market. I see craft beers taking over the sales of macro beers and not so much wine. You are either a beer drinker or a wine drinker, or both. See plenty of space for all of us. But lets put them head to head anyways, just for fun. There are two types of beers, lagers and ales. However, within those two beer types, there are thousands of styles that range from beers using pale malts with noble hops that are light in color, such as a Pilsner, to dark roasted malts with double American hops such as an American double stout. Within these 2 styles there are hundreds more. 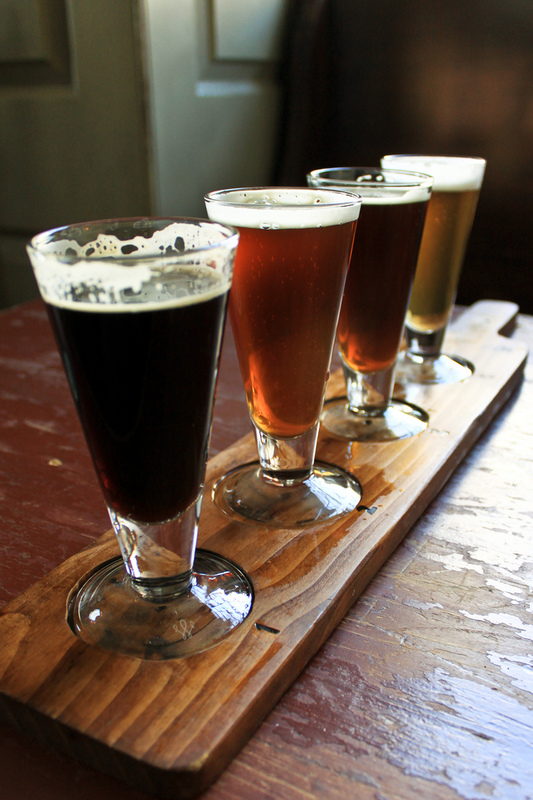 Most all beers use a percentage of pale malts to give the beer structure. After that, the percentage of roasted, smoked and charred malts will change that beer into a completely different style. And then within each different style of beer based solely on the percentage of pale and roasted malts, the addition of hops will decide a whole new style. Hops are what provide bitterness, aroma and flavors. Hops that are grown in different terroir have different flavoring characteristics. So a beer made with pale malts will vary style by the addition of either West coast hops (American), Noble (German), Nelson (New Zealand) or Goldings (English) and this list is also endless. That pale malted wort (wort is to beer as must is to grape) will change drastically by the hops the brewer has chosen to add. Next variation in style is the choice of yeast during fermentation. Will the beer be a lager or ale. Will that same beer be tank fermented, barrel or bottle fermented. Just by having a few different choices, the brewer can make hundreds of styles from one type of wort. At this point we haven’t even spoken about additives and adjuncts. The brewer can brew with coffee, chiles or what ever they want to experiment with. This takes that one simple style of beer to an infinite number of styles. So many beer drinkers feel that wine is way too complicated. I look at beer and think, “how can you wrap your head around so many styles?” Those same people believe that wine is snooty and pompous because we use words such as creamy, oaky, full-bodied and tannins. I believe that those people don’t drink good beer. Because when you drink a Greenflash Serrano Chile Double stout one has no problem using words such as full-bodied, malty, chocolate, nuts and a spicy finish with a slight mineral note. Those beer drinkers that knock wine for its lingo, do not drink good beer, because if they did, then they would get it. It wouldn’t just be refreshing and less filling. Beers can be sweet or dry. They can range from young, drink now beers to beers those that need cellaring. They can use different yeasts which create different esters. You can see an obvious difference even if you are a novice beer drinker from one to another. The colors have a huge variation and the hops intensity really differentiates one from the other. The tactile sensation on the palate is a lot more distinguishable from one style to the other. Certain beers are more astringent while others coat your tongue in creamy maltiness. Wine styles are based on grape types, regions and vinification methods. This is important when comparing the two, because in some ways it comparing apples and oranges. Beers come from grain, grain can grow in abundance and are not dependent on vintage. Beers is made year round. Wine comes from grapes, a crop which is only harvested once a year. Grapes are dependent upon their soil, climate and vintage. A slight change in temperatures at the time of harvest can make wine making very difficult. The crop needs to be monitored and cared for all year-long until its harvested. For this reason, wine has fewer styles. Winemakers are less apt to experiment in creating a new style of wine because they only have one time in the year to get it right. So most stick to traditions. There have been winemakers that have experimented in creating new wines, some have succeeded and others have failed miserably. Winemakers are limited by the grapes they use, the place where those grapes came from and the process of making wine. Let me explain. There are maybe 6 wine styles made from grapes: white wines, red wines, rose wines, sparkling wines, late harvest (sweet wines) and fortified wines. Within each style of wine there is some variation. Take white wines, you can have a cool climate, high acid very dry Sauvignon Blanc and a warm climate full-bodied creamy Chardonnay. These are huge variations for whites. 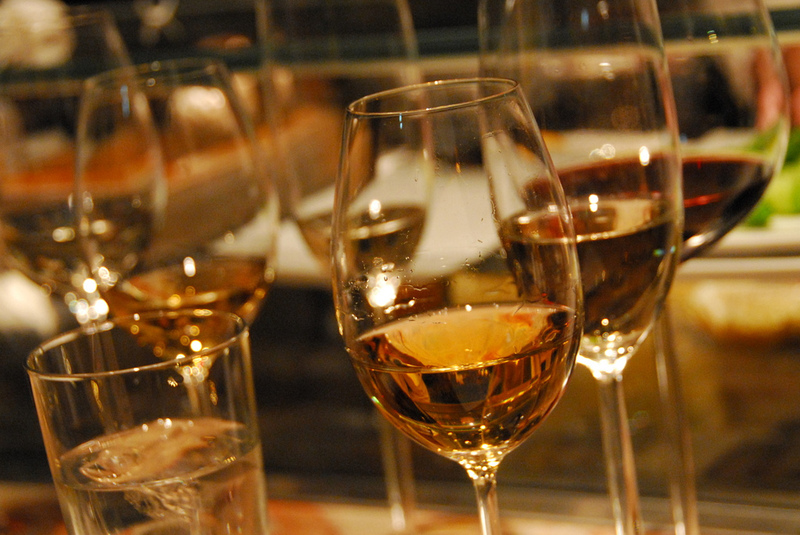 Within that spectrum fall in wines such as Rieslings which are sweet to off-dry to bone dry. You can have Viogniers from California which are aromatic and flabby to those from Condrieu which are leaner and more mineral driven. However, to the average consumer the difference are almost indistinguishable, they are merely white wines. This is why the master sommelier exam is so difficult. Trying to identify one from the other in a blind format is a daunting task. For example three different wines such as Chenin blanc, Riesling and Gruner Veltliner can be difficult to identify. Lets say winemakers wanted to add more styles of white wines by adding adjuncts. Well it’s been done before, but nothing ever sticks with consumer, because they’re just not that good. Whereas beers are always changing by adding adjuncts and the consumer thinks its cool. If we were to take just Stouts and Porters, you can probably find as many styles of Stouts and Porters as there are white wines. There are Oatmeal Stouts, Irish Dry Stouts, Baltic Lagers, American Stouts, Double Stouts and more. Within each of those categories the addition of adjuncts can change the style of Stout. The list is endless and includes adjuncts such as rye, wheat, corn, coffee, chiles (Serrano, Habanero, Jalapeno, Chipotle), Fruit (Cherry, Blackberry, Fig, Raspberry), Chocolate and the list goes on and on. Winemaker cannot do that to a Riesling, it would be sacrilegious. Today I compared wine and beer styles. One can see that there is so much more diversity in styles of beer and more and more are being created each and everyday across the many craft breweries in the world. Wine styles have a limit. They are restricted by growing regions, grape types, climate and vinification techniques. I am not saying one is better than the other, just different. What I have noticed with wine, styles may change but they usually go backwards and not forwards. What I mean by that is when I see a new trend in wine it usually means that the winery or winemaker is looking to the past for inspiration. For example take the trend of organic/biodynamic, orange wines or natural wines. These styles of wine come from the past. I guess it is safe to say wine is postmodern and beer is modernistic. Not sure I understand your comment. I’ve never tasted a 10/20/50 year old beer that tasted as fresh as when it was first bottled, nor have I tasted a wine that was as fresh as the first day it was bottled. Please share your opinion and let me know how you disagree. Cheers. On another note, I saw your post on Uruguay. Have you tried the wines in the North of Uruguay? They share an AVA with Brazil, Campanha, fun interesting wines which if you get a chance, check them out. I am preparing a power point on beer styles and really appreciate your article I will now now add a few slides to the presentation to include wine and their styles. Fantastic, I am glad you enjoyed it. I’d love to share with you my intro to beer presentation I teach my staff. I think you would dig it. Please send me yours, I’d love to see it. Cheers!